Mary did it a year ago and had marvelous success. I was a doubter. She has enormous, like, awe-inspiring discipline – and keeping to a rigid 500 calorie per day diet is something she can pull off with or without a chemical I said. She’d lose weight just because she’s taking in so little. HCG is a placebo… a talisman … a focal point for her to subconsciously think there’s something at work to help her. Nope. It works as advertised. Mare you were right, I was wrong. The goal for my experiment was 20lbs in 30 days. 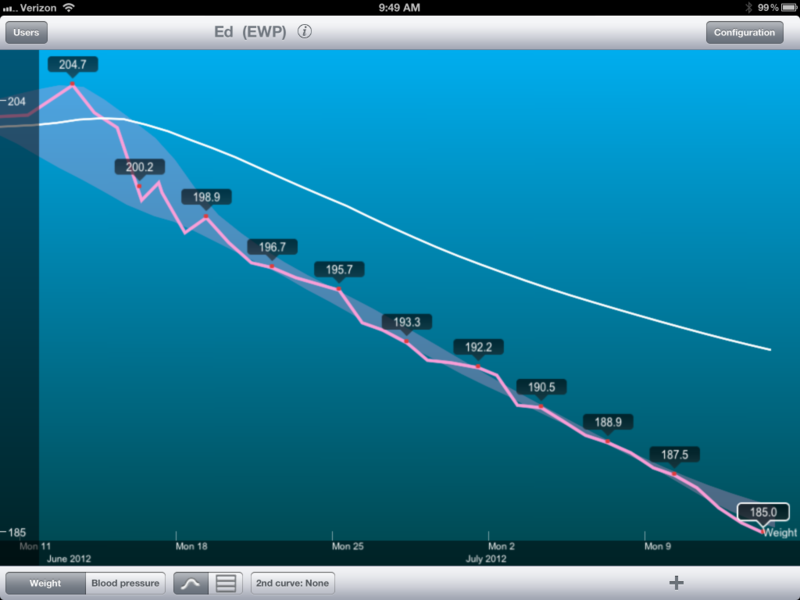 I did 19.7, as shown in the chart above (I weighed myself every day on a tracking scale). The assertion by the advocate doctors is that HCG is a naturally occurring hormone that women produce when they are pregnant. The issue is starvation: if a women is pregnant and doesn’t have enough to eat, rather than freezing up the metabolism or going into ketosis, your body frees up fat reserves to make sure the fetus gets all the nutrition it needs and mom doesn’t die. The further assertion is that the fat used is all-body: the notion of “fast fat” usage goes away and all of your fat reserves become available to you (and the imagined fetus). Well, I’ve got to tell you I think it’s true. Trying other diets in the past I’ve noticed that my stomach immediately shrinks, but the love handles persisted. At this point, I’ve pretty amazed to find that my essential body shape is unchanged, just reduced. Mary says she can definitely see it in my face and I can feel it in all of my clothing. More importantly, I’ve not had a Pepcid since the day I started and my knees don’t trick as often. The only way HCG works is if you are in starvation, so I needed to have only about 500 calories per day. Although I got over hunger in a few days, I really had to be cognizant of my blood sugar. If I didn’t have the afternoon fruit, then stood up quickly, WOW was I high. Like, grab a wall cause I might go down kind of high. More water and making sure I ate as prescribed eliminated these symptoms. The diet is a fruit in the morning, as much salad as you want, a cup and a half of vegetables and 6oz of meat (4 oz if you start at less than 150lbs, 8oz if you’re over 200) for lunch, a fruit in the afternoon and the same kind of meal as lunch for dinner. HCG tab under the tongue every 12 hours. I became a big fan of the Walden Farms products because MAN OH MAN does one need some variety. I think this also worked for me because I’m better with a project than a little dribble to-do. I can focus for 30 days on something no problem. But working through weight watchers to see a pound a week for 20 weeks would have been a lot harder. Especially since, when I look in the mirror I still have more I’d like to remove, I’m going on for another round. The next step (after this the next round) is maintenance. Here I think weight watchers diet notions can help. It’s about balance, regularly eating and portions. For probably the last dozen years I’ve been comfortable running on 2 cups of coffee and a Pepcid for the day, then having a huge dinner. I’m also messed up because of my parents vegetable strategy: Finish What’s On Your Plate Young Man. Tell ya, if there’s something on my plate I’m hungry. If it’s empty, I’m satisfied. Mary: Your example and discipline are astounding and I’m grateful. As one of my bigger birthdays approach (much too rapidly I might add) I am looking forward to a midlife shift … eating better, exercising more, staying healthfully alive as long as we can together. Thank you honey for the assistance and persistence. Here’s to the second half, my love.